You'd think I was on vacation after this short break, but I'm afraid that's not the case. The lazy days of summer are a misnomer for me, as I try to fit in everything that the warm weather has to offer. Often, this includes gatherings with friends and family, and in my case, my 'second family' of coworkers. The gang I work with love to eat, but we all eat different things. Some of the group are lactose intolerant, some are vegetarian, most are watching calories, and everyone wants more fiber. So, when my boss wanted to surprise our team with a recognition lunch prepared by us, I really had to push my improvisational skills. My first thoughts were to make a rice dish, but that idea was taken by my executive director. (You can't really argue with the director!) My manager decided to make a curry chicken, which was a lovely idea, but left a need to prepare something for the folks who don't eat meat. Alas, my challenge became creating a simple vegetarian dish that can be transported easily, reheated well in a microwave, was lighter in calories, had some fiber, and above all, was tasty. If I was the kind of person who was truly organized, I would have researched a dozen top vegetarian recipes, chosen a suitable candidate and prepared it in advance so I could test the recipe. I am not that person. In actuality, I went to the grocery store the night before, and perused the produce section for inspiration. 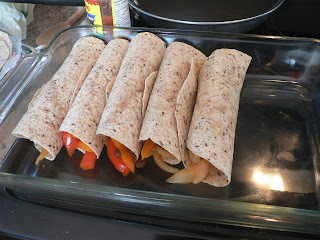 I immediately saw bright bell peppers and sweet vidalia onions, and quickly thought of enchiladas - they are easy to prepare, can be loaded with anything, and taste even better the next day. To round out the filling, I also included a mix of bella, shitake and white mushrooms, a touch of cilantro, and some black beans for protein. For added fiber benefit, I used multi-grain tortilla wraps. 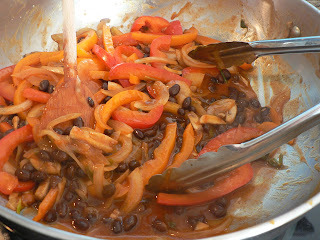 Once I got home, I sliced the peppers, onions and mushrooms, and quickly sauteed them for a few minutes - just enough to bring out some sweetness, yet retain a bit of bite. I used a mild taco sauce, lime juice and a pinch of chili powder to add a bit of flavour to the mix, and added the beans. After filling and rolling the tortillas, I placed them in a glass dish, poured tomato sauce over the top, then baked them in the oven for 30 minutes. They looked good, but the real test would be lunch. I was a nervous wreck. The team knows I like to cook, so I felt a bit of expectation for success. Fortunately, the lunch was a surprise, so no real questions could be posed in advance. The enchiladas reheated nicely, and looked appealing despite having to be served on paper plates. There were several 'oohs and ahhs', although polite whispers of 'what is it?' were floating around. I explained the ingredients and saw a wave of relief wash over the team. After lunch, there was not a bite left. :) The enchiladas were a hit! This challenge taught me a lot about how we connect with others. Taking the time to ensure everyone could enjoy the meal was a true recognition, and spoke volumes about respect, appreciation and care. As one person said to us later, "you could have just ordered in a lunch, but it means so much that you took the time to make a meal just for us". Indeed. When we 'break bread' together, everyone connects. It doesn't matter the gender, race, social class... we all are nurtured with wholesome foods. Having that time to break bread together helps take the mind off of the job and focus on the persons around us. Sounds like the luncheon was well worth the efforts! Sounds like it was a total hit! But really with such a gorgeous filling, no way could it have missed the mark! It's such a cliche but cooking something for someone or even a whole bunch of people is always so much more meaningful than just ordering or having it catered!